Hey sweetie!!! Today is your 29th birthday... I sure miss you and wish you were here to celebrate your birthday with us!! Still think of you everyday and miss you more than ever! I was thinking about you today and so I ended up on odmp....I still find myself looking across our lawns expecting to see you running up to your house....I know you are watching over your family, but please look out over us too....let your family know that caring hearts and loving thoughts go out to them from just one house away. Your loss is our loss! We are now bound as family until the Lord returns. I pray for you that you will continue to have the strength to do the Lord's ministry of being there for other families who experience similar situations. It was an honor and privilege to meet you. I pray that your son will rise to the highest calling of being a true public SERVANT that you, he himself and the community of Arlington will be proud of! God Bless You and Yours till he returns and we will all rejoice together at the feet of our Lord Jesus Christ! sister-in-blue...Rest in peace & may your loved ones hearts continue to heal . you are not forgotten. It's been eight years today since you left us. We still hear from many of your friends and see posts on this page from many who knew you and some that didn't. You made a difference in so many lives. May your smile light up heaven as it lit up earth.May He bless you and your loved ones. I am on my way to work today. As usual, I will clock in and look at your picture on the wall as I start my shift. You keep my mind in the right place everyday. I am more mentally prepared and am concious of what could happen at any given minute. It's sad that a lot of police don't have that frame of mind. You are so much missed by your family and all in Cockrell Hill. You have a positive direct impact on all that serve, especially in Cockrell Hill. Nothing is as important as one's life and well being, and I wish people in the city could make that a priority. Hey Tiff. Spoke with your dad yesterday. It sounds like your family is doing okay. I got all the updates on Chad and all the work your parents are doing with police survivors. I was telling your dad about this very vivid dream I had about you a couple of weeks ago. You were talking to me just like we used to and everything was okay. Like Karen, I think about you every day. I bet all our classmates and academy staff do. We all miss you! Anyway, I am expecting a baby in September. I wish you could meet him or her. Take care of us! Well it is getting near the time we do the memorial ride with your mom and dad. I can not beleive how strong they are, we have a daughter that we love very much along with two sons, I do not know if we could be as strong in our faith as your mom and dad are if we lost one of our children, I know you watch over them every day and see thier pain. I want you to know that you are missed and loved by so many people, me included, you were always a bright spot when you rode with us. I will continue to do the memorial ride as long as the good Lord allows me and will never forget you. Your mom and dad and brother are very special people and it has been my pleasure to call them friends. Watch over us. I have written before & stated that my partner was your partner. He have had some troubles as of late & not my partner anymore. I had lunch yesterday with the officer who found you in the car.It saddens me. I thank God every day! I look forward to meeting you one fine day in Heaven! Merry Christmas sweet Tiff!! Tell Jesus Happy Birthday for us!! Sure do miss you so very much, you are so precious and so are all the memories of you, so very precious!! I wanted you and your family to know that I think about you every single day and miss you so much. It still hurts. Like I have said before, if there was anything I could do to go back and change things, I would in a heartbeat. You were such a secial young lady and there is no doubt in my mind that you would be one heck of an officer. I was thinking about you today, my heart heavy still. I took your picture out of my wallet and stared at it till the tears blurred my vision and I could see you no more. Then I got to thinking how much you have meant to Joshua and me and I felt the overwhelming urge to thank you, once again. Thank you not for who you were, but for who you are, and forever will be. Remembering you on your birthday. I went to your gravesite today. The hot wind was blowing which made the chimes in the tree branch leaning down over your tombstone sing out. I couldn't help but have my eyes swell up with tears as I wished you a happy birthday in heaven. I know it's 7 days early, and I know I'll be celebrating your life and I know you will be too... just in heaven! I sure did enjoy my few moments there. May our God of comfort and peace be real to all who hurt because you're not here with us, this birthday of yours. I have the pleasure of working with your partner, he is a wonderful man & loved you dearly, wearing your badge # & initials on his arm. You & I also share the same birthday. I feel like I know you & I wish I had the pleasure. I will meet you someday. May God continue to bless your family & friends with wonderful memories. in may of 2000 we started hosting a supper for a motorcycle ride in honor Tiffany Hickey. Our son and daughter-in-law Michael and Stacy Wood, and children J.R. and K.C. ride with this group and they come every year on the second week-end in May. The group comes to our home for a crawfish boil. We have made many friends and feel honored to be a part of this ride in honor of Tiffany. I was fortunate enough to go to school with this young lady. We were both taking Criminal Justice classes at Hill College. We had several classes together and I was very impressed by her dedication to becoming a police officer. I remember the day she was involved in the accident and I prayed that she would be ok. I am sorry that she is gone and will never be forgotten. You are a hero and thank you for your dedication and love of police work. I know you had a life long dream of being a police officer, as did my son Michael. Parents can not keep their children from attaining their dreams and we can find some solace in our loss that you lost your life completing a dream of something you loved so much. People may ask, what kind of officer would she have become in the future, but I'm sure you already were that caliber of officer. You will never be forgotten and are a true hero. Keep watch over your loved ones, wrap your wings around them and help heal their broken hearts and protect them. 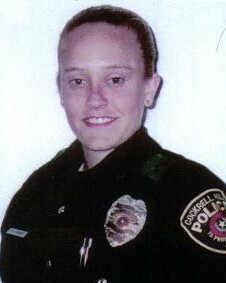 Last week I went to an Instructors course in collin county, and I ran across one officer who knew you and another who worked for Cockrell Hill now. It's amazing the number of lives that you continue to touch on a daily basis. I know that you are still looking out for all of us and I am thankful for that every day. Officer Hickey, I see your picture everyday in the court building before I clock in for shift and I see it everyday when I clock out. I am a shift supervisor and an FTO. I have never met you, but I think of you often and it helps remind me how precious life is and how I need to take advantage of my position to help people by protecting them and serving everyday. You gave the ultimate sacrafice. I don't know when my day will come, but I pray that when it does I am as as blessed, missed and loved as you are by all here in Cockrell Hill PD and the world. You were on your way to setting a remarkable precedent as a Law Enforcement Officer yet God had other plans for you. Although we may not ever understand, or want to understand why He chose to take you from us, we can only try to accept that He needed you more by His side than we did. Joshua was only seven years old when you left us and he immediately claimed you as his Guardian Angel. For Christmas, the year your little brother took his oath as a Police Officer, Joshua gave you back to him to be his Guardian Angel. I know you watch over both of them. I thank you. We know it was your desire to serve and to protect people's lives and to make a difference. You did.